This blog post has two stories of exceptional Toronto desis. It’s winter and the Greater Toronto Area (GTA) has had some snow activity, including one a few weeks ago when Ma Nature dumped several centimetres of white stuff on unsuspecting folks, Remember that one? Creativity is when you take the raw ingredients nature throws at you and you turn it into a viral work of art. Everyone, meet, Farah the Jatti aka Saddi Juliet, snowwoman extraordinaire. Rotund Saddi Juliet was decked in wedding finery. She wore an eye-catching crimson dupatta, accessorized with heavy gold (fake, obviously) jewelry, including a necklace, earrings, and maang (forehead) tikka and even fake eyelashes. Her creators? A couple of enterprising Brampton teens– Jassu Kingra, 19, Daljit Warraich Navi, 15, and Bini, 9. It was Daljit’s first winter in Canada. She wanted to stack the packed snow into a winter-tradition—a snowman so that she could show off to her relatives in India. Except, the empowered girls decided Frosty the Snowman was passé. There’s a hint of mystery to the whole exercise that will only likely be revealed when Brampton gets another substantial showering of snow (at least enough to build, I presume a desi “Jatti” a male counterpart). We can’t wait. 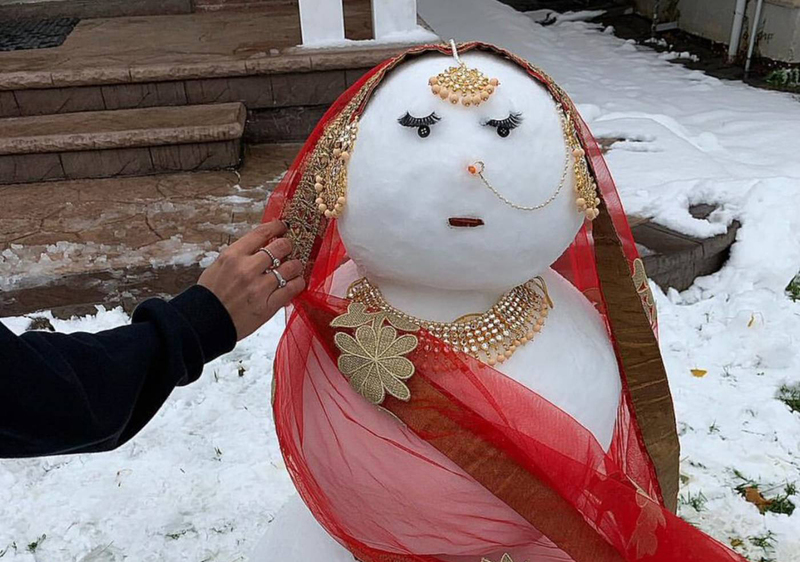 The desi snow-woman literally broke Twitter (84,000 tweeps “liked” her and hundreds of others showed love on Instagram and Reddit). Art is art, even when it’s fleeting. Here’s to the girls who warmed the hearts of everyone with their cool creation. Jasmine Dayal, a Toronto lawyer’s recently published a cookbook, JD In the Kitchen: Indian Appetizers and Chutneys features several South Asian recipes with East African flavours. Jasmine Dayal, I imagine, is always happy to swap the black robes—she wears to court as a lawyer— for an apron. In her book, JD In the Kitchen: Indian Appetizers and Chutneys, released some months ago, Jasmine shares Indian appetizers with East African influences. There are several familiar and some unfamiliar starters and entrees such as samosas, spicy crepes, beet and arvi bhajias, and others. Jasmine is also the founder of a lifestyle website JD in the Kitchen. Here you can check out recipes, learn about the spices that make Indian cooking bold and flavourful, and browse through an online store where you can buy her three books, yes, she has three of them, and some of the fresh spices she uses in her recipes. Jasmine Dayal’s cookbook: JD In the Kitchen: Indian Appetizers and Chutneys, features several appetizers and starters with East African flavours. 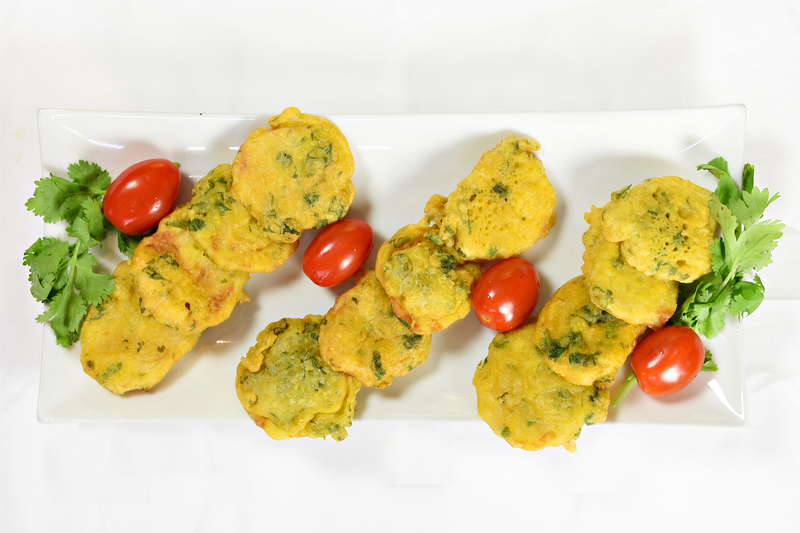 These skewers of Ismaili Bhajia made with chickpea flour, potatoes, and other spices are a true definition of comfort food. Photo supplied by Jasmine Dayal. JD in the Kitchen: Indian Appetizers and Chutneys, is a slim 81-page cookbook with recipes that are not elaborate. They are ideal for both novices as well as aspiring cooks. Jasmine started JD In the Kitchen website, as a portal to shares her love for cooking. Despite juggling a hectic schedule, it appears Jasmine carves time to make meals for her family. What’s more, she’s generous enough to share the recipes. Born and raised in Toronto, Ontario, Jasmine’s career as an articling student started in 2005 at Fireman Wolfe LLP. She became an associate at the same firm and is now a partner in the firm that now carries her name – Jasmine Daya & Co., Impressive no? JD In the Kitchen: Indian Appetizers and Chutneys is now available on Amazon and on her website. 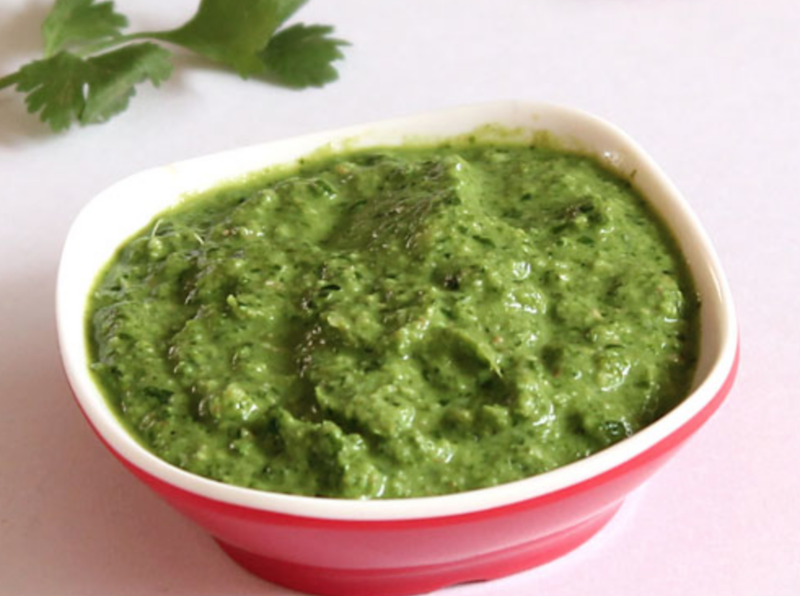 This green chutney prepared with cilantro and green chilies is a perfect dance partner to almost all appetizers. 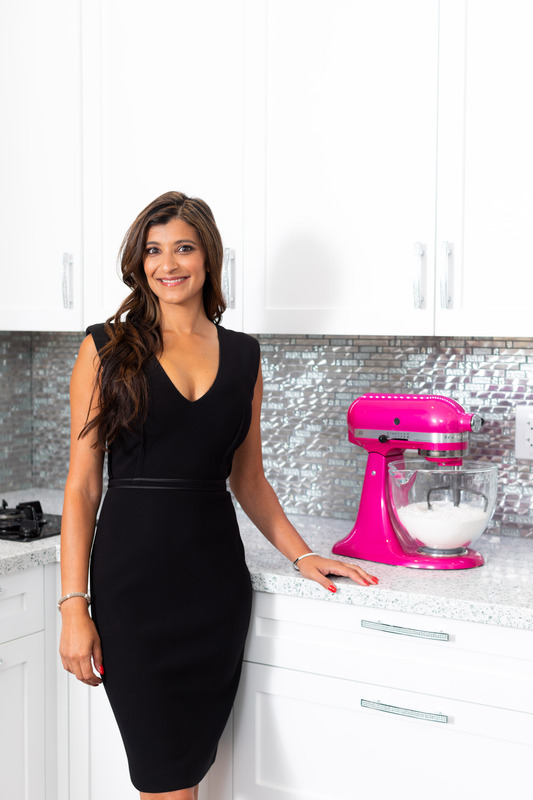 Toronto lawyer, mom, and cooking enthusiast Jasmine Dayal creates several recipes in her just-published cookbook, JD In the Kitchen: Indian Appetizers and Chutneys. Photo supplied by Jasmine Dayal. In a mixing bowl, combine all ingredients except the potatoes and oil to create a smooth batter. In a frying pan, heat oil over medium heat. Note: There should be enough oil for the potato slice to sink to the bottom and become submerged. Take one potato slice at a time, dip it into the chickpea batter, coat well and then place it gently into the oil. Cook for about a minute and then flip it to cook the other side. Remove, place the Bhajia on a paper towel to absorb excess oil. Enjoy it with green chutney (recipe in Jasmine’s book). Toronto Desi Diaries wishes everyone a Merry Christmas. Details: Supporting Our Community’s Health (SOCH), will be hosting a series of mental health workshops, to increase awareness and education about what depression is and how it can be treated. These interactive workshops will take place in both English and Punjabi at the Chinguacousy Branch Library, 150 Central Park Dr. at 1:30. On the agenda: Kundalini Yoga for Depression by Harvir Grewal. Details: South Asian Canadians Health & Social Services (SACHSS), a registered not- for-profit charity offering services that include mental health, addiction, stress management, anger management and more is hosting a fundraising gala at Natraj Banquet Hall, 7275 Torbram Rd., Mississauga at 5 p.m. Dr. Hamid Slimi is the guest speaker. Details: Desi Dreamz is hosting its singles event for South Asians between 26 to 47 years. The event will take place at Novotel Toronto, 3670 Hurontario St., Mississauga from3 p.m. onward. Details: Enjoy the magic of winter with family at Disney On Ice with Reach For The Stars, a brand new show featuring a host of beloved Disney characters and stories. The shows run until Jan. 1 at Toronto Theatre, 1 Blue Jays Way. Details: PGA International will be hosting its annual New Year’s bash at Moonlight Convention Centre, 6835 Professional Crt., Mississauga. Festivities start at 7:30 p.m. and will continue until 2:30 p.m. Details: Bollywood Tunes and Kalpesh Patel are hosting NYE 2018 at Chandani Convention Centre, 5 Gateway Blvd. Brampton from 6:30 p.m. onward. Off the bat, I can guarantee one thing. Watching one episode of the hugely successful web series Anarkali won’t do it. You’ll likely end up binge watching the entire two seasons. The show will also stir a longing for your squad (if you’re caught in motherhood/career and your teenage years are a hazy blur). The web-series created by the immensely talented Rakhi Mutta and edited by an equally competent Kiran Rai (lead actor/Anarkali) presents a vignette of a young desi woman’s life in North America. It’s told with humour, sensitivity, drama and melodrama. The YouTube series is about a devastated Anarkali (Kiran) who gets dumped by her fiancée Prince (Gavan Anand). The slow unraveling of her life and identity post-breakup, is the premise of the show. So far, Anarkali has become an Internet hit in over half-a-dozen countries around the world with some 20,000 YouTube subscribers and 650,000 views. Mainstream and ethnic media, Rakhi said, do not reflect the truth of brown women’s lives when it comes to dating. This may be the reason Anarkli has wowed audiences world wide. What’s worth underscoring here is that the cast and crew have produced a stellar product on a shoestring budget. Calling it a budget is bit ambitious. I am told, it’s a bartering system (pizza, as form of payment, as well as sustenance) . Delivering a hit show with slow and clunky hardware and out dated software to me demonstrates class, substance and style. Just like athletes from third-world countries that win gold medals in Olympics wearing ratty shoes, Anarkali connects with the audience through pure storytelling. In another scene, Roop’s (Amrit Kaur) boyfriend proposes to her and tells her to quit her job because he wants to take care of her. That gave Rakhi the perfect segue into discussing the independent woman (cough, cough, it’s Rakhi) who wants to make it on her own. The complexities of desi women growing up in the diaspora are fodder for Rakhi’s pen. Each 10-minute episode tackles parental and societal pressures, boyfriends that come across as unqualified jerks, and a band of super crazy, loyal and fearless friends whose antics are never boring. In Nov. 2014, Rakhi had plans to attend a Sikh feminist conference in Detroit. The organizers asked her to collect two other delegates from Brampton. The two turned out to be: Rupi Kaur and Kiran. The radio lay silent and as the car ate up the miles, the three women forged a solid camaraderie. Once they returned home, they kept in touch. Watching Kiran’s mannerism reminded Rakhi about something or rather someone. “You’re Anarkali!” Rakhi told Kiran one day. Rakhi shot the pilot episode of Anarkali in Feb. 2015 and then promptly sat on it for months because she was afraid it would bomb. Then, on Kiran’s insistence, she uploaded the episode to YouTube and waited. To save face, Rakhi prayed for a minimum of 5,000 hits, but she was taken aback because the views exceeded her initial estimates. Celebrations turned sour soon. An unscrupulous Facebook user scrubbed the credits from the pilot episode and uploaded the film through his Facebook account and disseminated it. The film spread like wildfire garnering some 32,000 hits, but no one on earth knew who had come up with the brilliant idea and the credit for the film becoming viral went to the thief. Rakhi, 35, created Anarkali when she was 19. The well-fleshed and complex character was Rakhi’s own creativity at work. She detailed the life of every 20 or 30-something brown woman finding her way. The script caught dust as the filmmaker pursued a career in development. This line of introspection led Rakhi to learn the nuances of photography. Shout out to her friend Natasha Daniel, who schooled her in the basics. Once she understood the lens, Rakhi found her calling. Her repertoire of works includes: Haneri, a film on mental health, an educational video on honour killings, Silent Struggles, that looks at elder abuse in the Punjabi Community and of course, the fictional (Anarkali). You can watch two seasons of the show on YouTube. Shooting for Season 3 will start soon. Next time, we will profile the show’s heart and soul, Anarkali aka Kiran Rai. Stay tuned.